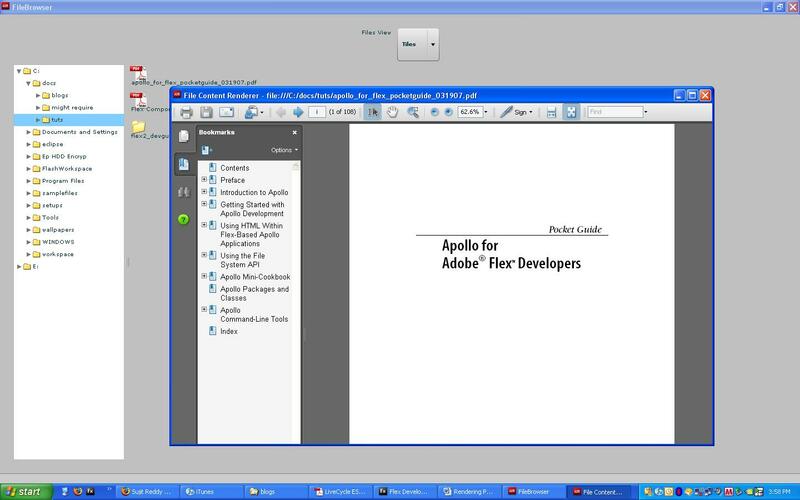 We can render PDF content in Adobe AIR application. You have to use the HTMLLoader to load the PDF and add the HTMLLoader to the window. You cannot add HTMLLoader as a child to the Flex containers as the Flex containers expect the child components to be a UIComponent, so we have to wrap the HTMLLoader into UIComponent and then add it to the Flex containers. This same code can be used for HTML, TXT, JPG and PNG files. If the file being loaded is not PDF then we need not check for the PDF capability. This entry was posted on Friday, January 4th, 2008 at 10:36 am and is filed under Adobe AIR, flex. You can follow any responses to this entry through the RSS 2.0 feed. You can leave a response, or trackback from your own site. This code is not working, any ideas? PDF rendering is nice, but it’s somewhat useless without control over the Acrobat window itself. Specifically, how do you add/remove the acrobat controls to create a more seamless integration with Flash? I like the idea but I just cant seem to get it to work. I get a black screen. By the way I am using Flex 3 Air. When are you getting this black screen? is it coming when u r trying to render the PDF or the image? Can you also check out if the loading is completed using the complete event of the loader. I would not really call that “rendering” a pdf – it looks like adobe reader is just displaying it inside the window. I am in a situation where I really need to actually render multiple pdf files in a window. I’m not talking multiple page pdf files. I’m talking about graphics in pdf format that I need to display just like you would a jpeg or something. I think Apple’s Safari supports such an idea for svg files now. And I don’t want adobe reader to have to load every time. If anyone knows if you can do this and how, I’d love to hear it! Please try handling the “complete” event of the HTMLLoader to make sure the loading of the document is complete. Sombody here commented that he is getting Blank screen After PDF is rendered. It happens if the following in the app.xml file is set, comment them out and it should work. In transparent applicaiotn window, it displays as Balnk screen. ohh HTML didnt display properly in my previous comment. i stil new in flex, do u mind give us the fullcode or example. TypeError: Error #1034: Type Coercion failed: cannot convert flash.html::HTMLLoader@3937239 to mx.core.IUIComponent. You need to wrap the HTMLLoaded in a UIComponent as in the code above. You might be interested also in this short post I had for PDF rendering in AIR. Is it possible to implement the same in web application. No, you cannot do the same in a web application. Few people use IFrame to render PDF. Please try searching for Flex + Iframe. Thank you for your forum. I’m trying to build an application that will allow me to view pdfs when they are selected from a datagrid. I’m new to Flex/Air and I’m having trouble getting the Reader to change the pdf after the first one is loaded. Any ideas? Can I use the locationChange or removeChild properties? I’ve tried but keep getting errors. re hiding Acrobat controls: If you have a copy of Acrobat (not Reader) you can set the document preference to hide the toolbar when the file’s opened — this is something you save as part of a specific PDF file though. Hopefully this works as I’ll be trying something similar soon. Thanks a lot for the example Sujit – how do I “add it to any container”? e.g. Window as per the screenshots at the top of the page? Thanks for the example. Is that possible to set the wmode transparent through htmlLoader? Is there a sample project somewhere? I am not sure what objects to place on my form or if there are any libaries in particular that need using. I am getting the same issue blank screen. I am not sure whether this question belong in this forum.. But If anyone has used jasperserver with Adobe air please help me.. I have my application build in Adobe Air and one of the feature is to show the reports. I am able to see the report properly on adobe air when I pass the url through Iframe. But when I pass the URL with Output=pdf or when I click the pdf icon from jasper report, opens a new adobe air window with a black screen and this happens for all the different exports ie excel…. When I use the same application by triggering in IE, Firefox or Google chrome, it opens a new window or tab and shows me the pdf version. So I need help either to get me the pdf in that new adobe air window or open in the users deafult browser that pdf. Hi, i wonder if someone can tell me how i close the pdf-file after i’ve opening it? Isnt there a way to render PDFs with in the Flex WebApps?? HTMLLoader is avail only in AIR not in Flex Web apps. But using iFrames in Enterprise apps is not secured… Is there any other way.. Why Adobe hasnt provide components for Flex webapps like AIRs..
Hello guys, I need to resize an image in a PDF document. How do I do it? Does anybody know of any work arounds to display a pdf in a transparent window? hi friend, i have done it. but i need to edit and save the pdf files. how should i do? pleas help me. How do I open a PDF file from the local machine (instead of a web server via HTTP) in the AIR app? Hmm when upgrading Reader to 9.2.0 the pdf’s fail to load in Adobe AIR. Anyone who runs into this issue as well? 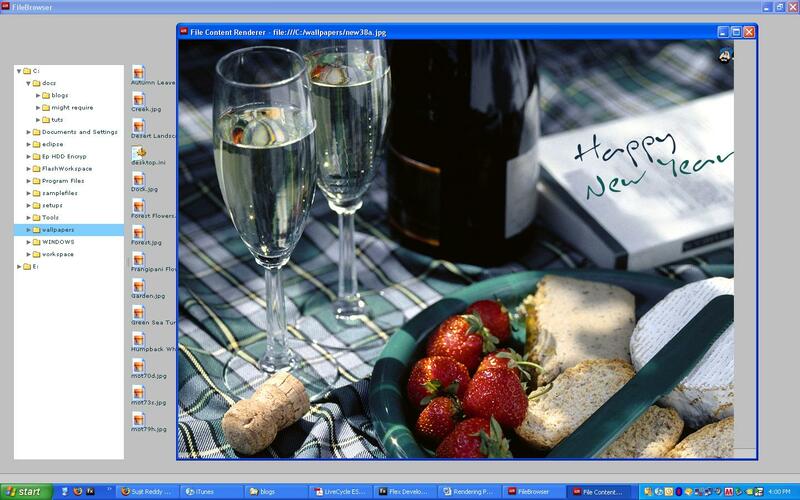 Jermey, workaround for transparent windows is to open a new window with PDF. Thanks…i was searching for a reason at my problem, my app was correctly working few weeks ago, and yesterday it was impossible to open pdf..and i haven’t notice that i’d upgrade acrobat reader ! Anyone found a workaround or patch for the bug with 9.2.0? Found the workaround for the 9.2.0 bug… had to update to the latest AIR runtime and update the AIR SDK to the latest. I have try the code, and I was also getting a white screen, so i checked the transparency attribute but with no success. Also I have tried to change the Flex SDK, but with no success too. So at the end I have reinstalled my adobe reader to 9.3, and that worked. You can use add #toolbar=0 to url of pdf to hide the toolbar. Tested it with Acrobat. the open PDF Parameter seem not to work when using it in local file system. Does somebody has an idea or solution ? Have you found a solution to applying the open parameters to a local file system URL? I could use this too. Any help appreciated! Unfortunately no. I didnt find anything. If you do, let us know. chintan, your right about the transparency setting in the app.xml. Good find, was driving me crazy! can we give print functionality to our pdf. Means can we show multiple pages pdf in air and allow user to print single page or whole pdf ? hintan, your right about the transparency setting in the app.xml. Good find, was driving me crazy! Hiya, All seems to be working fine loading my pdf in a new window but when I close the window containing the pdf another blank window appears in its place with title “about:blank”. I might be being silly but I can’t see why this is? Anyone had a similar problem?